This was posted to my mail newsletter a few months ago. Subscribe now if you want to receive this kind of content to your inbox. I won't spam you, promise. When do you have your best ideas? If you are anything like me, I have my best ideas when I can't act upon them. While I'm falling asleep or while I'm taking a shower. And a lot of them get lost forever, I always think I'll remember it next morning, something that never happens. But I found a nice way to solve this, with a solution very similar to the memory palace technique for remembering lists. Use a mental drawer. I have to confess that the idea is not completely mine... I read it a long time ago in the preface to Four Past Midnight , by Stephen King. He uses it for drafting his book ideas. King puts ideas in the drawer and lets them grow. 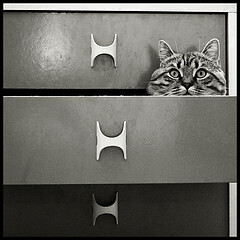 We won't be using the drawer like him, but the idea is pretty similar. You need to imagine your mental drawer (design it as you wish! modern Swedish style or 18th century wood, as you please), as vividly as possible. Feel the smell of wood (or lacquer), the sound as it opens and closes, the feeling of its surface. Keep it in mind for a few days, mentally opening and closing it as soon as you wake up or get out of the shower. After getting used to it, you are ready to harness its power. Imagine you have an idea before falling asleep, for example that you'd like to interview Steven Pressfield (like I did, read here). You want to keep this idea, as it sounds interesting and worthwhile but don't want to turn on the lights and write it down: you are almost asleep, turning on the lights will mean 30 minutes before falling asleep again. Now you have a solution: mentally open your drawer and put (imagining it as vividly as possible) something related to Steven Pressfield. For it to work more effectively, the image has to be bizarre. You could imagine Steven Pressfield squirming inside the drawer like a contorsionist, or a bunch of Spartan soldiers getting out of it (Pressfield wrote Gates of Fire, about the Battle of Thermopilæ). As soon as you wake up, you check your mental drawer, notice Steven inside it and write down the idea in your notebook. Easy and effective. Of course, for it to work you need to make checking your drawer a daily habit, but this is another whole story I'll write about any other time. Stay tuned, and share with your friends if you liked this post. This technique will be a small part of an upcoming ebook on memory techniques I'm currently writing. If you are interested in being a "beta reader" or even being an affiliate/reviewer, just drop me an email. Don't be shy!